This article is about Russian conscripts between 1721 and 1857. For the similar system operated in Prussia between 1733 and 1813, see Canton System (Prussia). Cantonists (Russian language: Кантонисты) were underage sons of Russian conscripts who from 1721 were educated in special "canton schools" (Кантонистские школы) for future military service (the schools were called garrison schools in the 18th century). The canton schools were eventually abolished in 1857. Cantonist schools were established by the 1721 decree of Tsar Peter the Great that stipulated that every regiment was required to maintain a school for 50 boys. Their enrollment was increased in 1732, and the term was set from the age of 7 to 15. The curriculum included grammar and arithmetic, and those with a corresponding aptitude were taught artillery, fortification, music and singing, scrivenery, equine veterinary science, or mechanics. Those lacking in any talent were taught carpentry, blacksmithing, shoemaking and other trades useful to the military. The ablest ones were taught for additional 3 years, until the age of 18. All entered military service at the completion of their studies. The decree of 1758 required all male children of the military personnel to be taught in the cantonist schools. In 1798 a military "asylum-orphanage" was established in St Petersburg, and all regimental schools were renamed after it, the total enrollment reaching 16 400. The schools were reorganized in 1805 and all children were now referred to as cantonists. After the War of 1812 their number increased dramatically, when many orphaned children of military personnel killed in the war enrolled in cantonist schools voluntarily. During this period the curriculum of cantonist schools was equivalent to that of gymnasia, and military subjects were not taught. In 1824 all cantonist schools were made answerable to the Director of Military Settlements Count Aleksey Arakcheyev, and in 1826 they were organized into cantonist battalions. The standards of curriculum dropped significantly, and it was limited to the subjects useful to the military. During the reign of the Nicholas I of Russia the number of cantonists reached 36,000. Several cantonist battalions became specialized: they prepared auditors, artillerists, engineers, military surgeons, cartographers. More children were added to the category of cantonists. Eventually children of the discharged soldiers were also included, illegitimate children of soldiers' wives' or widows', and even foundlings. Legitimate sons of staff-officers, and all officers awarded the Order of St. Vladimir 4th class. A single son of a junior staff-officer, out of a total number of his children, if he had no sons born after his attainment of the officer's rank. A single son of a junior officer maimed in battle. A single son of a widow of a junior officer or an enlisted man killed in action or deceased during service. Children of nobility were required to serve for 3 years at the completion of their studies. Children of senior officers - 6 years. Children of clergy - 8 years. All other social categories - 25 years. There were forcible conscription of underage recruits from the populations of Old Believers, Gypsies, and common vagabonds from 1805, Jews from 1827, and Poles from 1831. After 1827, the term was applied to Jewish and Karaite boys, who were drafted to military service at the age of twelve and placed for their six-year military education in cantonist schools. Like all other conscripts, they were required to serve in the Imperial Russian army for 25 years after the completion of their studies (in 1834 the term was reduced to 20 years plus five years in reserve and in 1855 to 12 years plus three years of reserve). According to the "Statute on Conscription Duty" signed by Tsar Nicholas I of Russia on August 26 (September 7 new style), 1827, Jews were made liable to personal military service and were subject to the same conscription quota as all other tax-paying estates ("sosloviya") in the Russian Empire. The total number of conscripts was uniform for all populations (four conscripts per each thousand subjects); however, the actual recruitment was implemented by the local qahals and so a disproportionate number of Jewish conscripts were underage. The main goal behind the compulsory military service was the integration of Jews and other non-Russian minorities into Russian society (effectively to the detriment of their religious and national identities). Ukrainian and Polish cantonists were also pressured to assimilate, as part of general policy of Russification. However, in the case of Jews, unlike similar measures implemented earlier by the Austro-Hungarian Emperor Joseph II, the Russian policy failed to provide greater civil and economic rights. In the aftermath of the Polish uprising of 1831, children of political prisoners and boys on the streets of captured cities often were abducted, and placed in cantonist schools, with the intent of their Russification. The vast majority of Jews entered the Russian Empire with the territories acquired as the result of the last partitions of Poland of the 1790s; their civil rights were severely restricted (see Pale of Settlement). Most lacked knowledge of the official Russian language. Before 1827, Jews were doubly taxed in lieu of being obligated to serve in the army  and their inclusion was supposed to alleviate this burden. However, the number of recruits reduced the number of young men that could go into the workforce, and this in combination with political restrictions led to widespread destitution. Russia was divided into northern, southern, eastern, and western "conscription zones" and the levy was announced annually for only one of them. The Pale of Jewish settlement was outside conscription in the fallow years, so the conscription in general and of cantonists in particular occurred once every four years, except during the Crimean War, when conscription was annual. The first 1827 draft involved some 1,800 Jewish conscripts; by the qahal's decision half of them were children. In 1843 the conscription system was extended to the Kingdom of Poland that was previously exempt from it. There were some significant differences in treatment of Jews and non-Jews: all others were required to provide conscripts between 18 and 35, while for Jews the age limit was 12–25, and it was left to the discretion of the Jewish qahal to choose conscripts from whatever age they decided. Thus in practice, Jewish children were often conscripted as young as eight or nine years old. This system created a disproportionate number of Jewish cantonists, and betrayed the utilitarian agenda of the statute: to draft those more likely to be susceptible to external influence, and thus to assimilation. The zoning rule was suspended during the Crimean war, when conscription became annual. During this period the qahals leaders would employ informers and kidnappers (Russian: "ловчики", lovchiki, Yiddish: ‎khappers), as many potential conscripts preferred to run away rather than voluntarily submit. In the case of unfulfilled quotas, younger boys of eight and even younger were frequently taken. 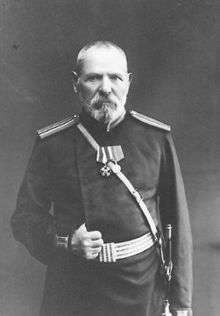 Herzel Yankel Tsam, one of only eight Jewish officers in the Russian army in the 19th century. Drafted as a 17-year-old cantonist, he became an officer in 1873. He was not allowed any promotions beyond captain until his retirement after 41 years of service, when he was given rank and pension of a colonel. In spite of pressures, he never converted. All cantonists were institutionally underfed, and encouraged to steal food from the local population, in emulation of the Spartan character building. On one occasion in 1856, a Jewish cantonist Khodulevich managed to steal the Tsar's own watch during military games at Uman. Not only was he not punished, but he was given a reward of 25 roubles for his prowess. The boys in cantonist schools were given extensive training in Russian grammar (and sometimes literature), and mathematics, in particular geometry necessary in naval and artillery service. Those who showed aptitude for music were trained in singing and instrumental music, as the Imperial Army had a large demand for military wind bands and choirs. Some cavalry regiments maintained equestrian bands of torban players, and cantonist schools supplied these as well. Some cantonist schools also prepared firearms mechanics, veterinarians for cavalry, and administrators ("auditors"). The official policy was to encourage their conversion to the state religion of Orthodox Christianity and Jewish boys were coerced to baptism. As kosher food was unavailable, they were faced with the necessity of abandoning of Jewish dietary laws. Polish Catholic boys were subject to similar pressure to convert and assimilate as the Russian Empire was hostile to Catholicism and Polish nationalism. Initially conversions were few, but after the escalation of missionary activities in the cantonist schools in 1844, about one third of all Jewish cantonists would have undergone conversion. For all cantonists, their 25-year term of service began after they reached the age of 18 and were distributed into the army. The distribution patterns of the 18-year-old cantonists show that Jews were not discriminated against: they demonstrated similar average literacy, physical ability, and training accomplishments and were sent in the same army and navy regiments as Christian graduating cantonists. A comparison between baptized and unbaptized Jewish cantonists indicates relatively insignificant advantages that the former enjoyed over the latter. "... the formal incorporation of Jews into Nicolas I's army was quickly compromised by laws distinguishing Jewish from non-Jewish soldiers. Less than two years after the 1827 decree on conscription, Jews were barred from certain elite units, and beginning in 1832 they were subject to separate, more stringent criteria for promotion, which required that they "distinguish themselves in combat with the enemy." Jews who refused to convert were barred from ascending above the rank of "унтер-офицер" i.e. NCO. There were only eight exceptions that were recorded during the 19th century. These restrictions were not lifted until the February Revolution in 1917. Some baptized cantonists eventually reached high ranks in the Imperial Army and Navy; among them were generals Grulev, Arnoldi, Zeil, Khanukov; admirals Kaufman, Sapsay, Kefali. The cantonists' fate was sometimes described by Yiddish and Russian literature classics. Alexander Herzen in his My Past and Thoughts described his somber encounter with Jewish cantonists. While being convoyed to his exile in 1835 at Vyatka, Herzen met a unit of emaciated Jewish cantonists, some eight years old, who were marched to Kazan. Their (sympathetic) officer complained that a third had already died. Nikolai Leskov described underage Jewish cantonists in his 1863 story "The Musk-Ox" (Ovtsebyk). Judah Steinberg described underage Jewish cantonists in his novel "In Those Days" (English translation in 1915, from the Hebrew). The cantonist policy was abolished by Tsar Alexander II's decree on 26 August 1856, in the aftermath of the Russian defeat in the Crimean war, which made evident the dire necessity for the modernisation of the Russian military forces. All unconverted cantonists and recruits under the age of 20 were returned to their families. The underage converted cantonists were given to their godparents. However the implementation of the abolition took nearly 3 years. It is estimated that between 30,000 and 70,000 Jewish boys served as cantonists, their numbers were disproportionately high in relation to the total number of cantonists. Jewish boys comprised about 20% of cantonists at the schools in Riga and Vitebsk, and as much as 50% at Kazan and Kiev schools. A general estimate for the years 1840–1850 seems to have been about 15%. In general Jews comprised a disproportionate number of recruits (ten for every thousand of the male population as opposed to seven out of every thousand), the number was tripled during the Crimean War (1853–1856). At the conclusion of the conscription term, former cantonists were allowed to live and own land anywhere in the Empire, outside the Pale of Settlement. The earliest Jewish communities in Finland were Jewish cantonists who had completed their service. The rate of conversion was generally high, at about one third, as was eventual intermarriage. Most never returned to their homes. Jewish cantonist recruits in 1843–1854, according to statistics of the Russian War Ministry. Only in the eleven years listed below – the total of 29,115 children were conscripted. It is assumed that between 1827 and 1856, there were over 50,000 of them. ↑ Wojciech Rudny (June 29, 2004). "Skutki rewolucji listopadowej dla sprawy polskiej (In the aftermath of the Polish January Uprising)". Racjonalista.pl. Retrieved July 28, 2012. ↑ (Russian) Alexander Herzen. "Былое и думы" (My Past and Thoughts), end of Chapter 13: "Беда да и только, треть осталась на дороге." ↑ Yohanan Petrovsky-Stern "Drafted into Modernity: Jews in the Russian Army (1827-1917)"